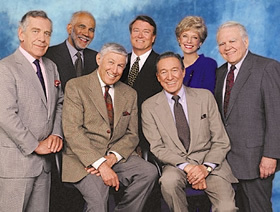 Performers include: Morley Safer, Harry Smith, Steve Kroft, Lesley Stahl, Bob Simon, Scott Pelley, Lara Logan, Katie Couric, Anderson Cooper, Byron Pitts, Mike Wallace, Charles Kuralt, Dan Rather, Walter Cronkite, Harry Reasoner, Roger Mudd, Eric Sevareid, Bill Plante, John Hart, Bob Schieffer, Morton Dean, Ed Bradley, Marlene Sanders, Diane Sawyer, Charles Osgood, Meredith Vieira, Charlie Rose, Forrest Sawyer, Connie Chung, Paula Zahn, John Roberts, Russ Mitchell, Christiane Amanpour, Bryant Gumbel, and Andy Rooney. TV show description: The granddaddy of the investigative news series, this show’s opening shot of a stopwatch has become a recognizable icon known the world over. If there’s a story that needs to be told, the award-winning journalists have often been the first to bring it to TV viewers. Is 60 Minutes as relevant today? Styled after a typical printed news magazine, each episode opens with a shot of the cover and then a table of contents; a brief description of each of the three news segments to be covered. Correspondents introduce individual segments while sitting in front of a magazine mockup of a particular story. Over the years, the list of correspondents that have contributed to the show has become a virtual who’s who in the news world. The features cover a wide variety of topics — from politics, scandals, and corporate corruption to cultural phenomenon, celebrity interviews, and profiles of everyday people. Segments often focus on the human side a story rather than simply numbers and graphs. Some notable stories have included the Watergate break-in, tensions in the Middle East and Northern Ireland, the impact of natural disasters, the poppy fields of Turkey, the plight of Jordanian Jews, and Afghan resistance to the Soviet invasion of 1980. There have been a few format changes over the years, but since 1979, the end of the show has belonged to commentator Andy Rooney. The loveable curmudgeon is given a few moments to offer his colorful and insightful commentary about the topic of the day. It’s just one more feature of this long-running show that keeps people talking at the water cooler on Monday morning. get rid of this show old like snl terrible and horrible why do want watch this shows. need get cancelled already biggest loser few years some of housewife reality crap throw it off terrible.